3-61 PROGRAM TRACKING AND REPORTING SUBSYSTEM (PTRS) ACTIVITY CODE. 1230. 3-62 OBJECTIVE. The objective of this task is to determine if an applicant is eligible for issuance or renewal of a Certificate of Waiver (CoW) for banner towing operations. Successful completion of this task results in the issuance of a CoW or letter of disapproval. Inspectors should refer to FAA/FS-I-8700-1, Information for Banner Towing Operations, for additional information. A. Authority. Title 14 of the Code of Federal Regulations (14 CFR) part 91, § 91.311 states that no pilot of a civil aircraft may tow anything with that aircraft (other than under § 91.309) except in accordance with the terms of a CoW issued by the Administrator. B. Definition. A banner is an advertising medium supported by a temporary framework attached externally to the aircraft and towed behind the aircraft. D. Federal Statutory Mandates. See Figure 3-13, Public Laws Associated With Banner Towing Operations, for guidance regarding applicable statutory mandates for banner towing operations and flight data center (FDC) Notice to Airmen (NOTAM) information regarding special security instructions for select sporting events. The information in Figure 3-13 is subject to change or cancellation. E. Web-Based Operations Safety System (WebOPSS). WebOPSS allows for national visibility and tracking for all approved CoWs and is the preferred method of issuing CoWs for banner towing operations. F. Forms Used. 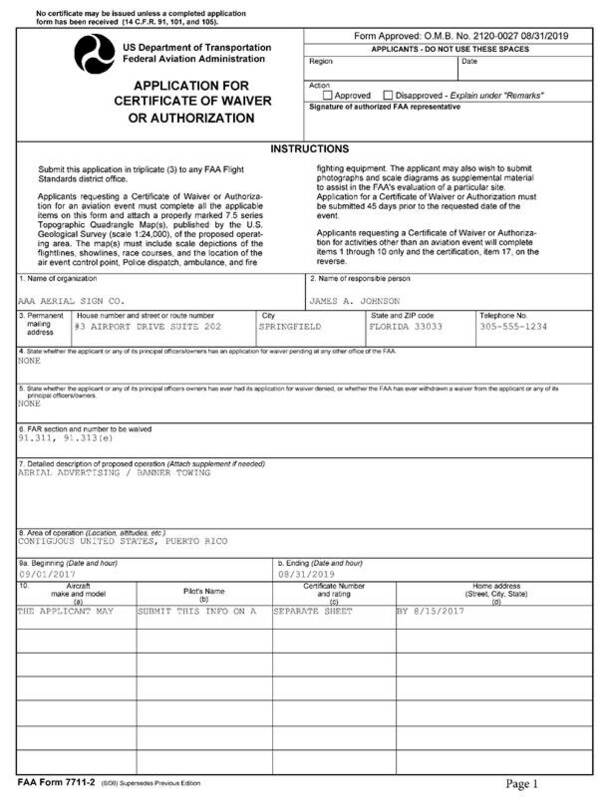 Federal Aviation Administration (FAA) Form 7711-2, Application for Certificate of Waiver or Authorization (see Figure 3-6), is a multipurpose form used to apply for a banner towing CoW and may be used to apply for a CoW for restricted category civil aircraft operations. The banner towing CoW will be issued using CoW J550, Banner Towing Operations, in WebOPSS. The approved application must be attached to, carried with, and become a part of the issued CoW J550. The FAA Form 7711-2 blocks that apply to banner towing operations are listed in subparagraph 3-67C. G. Submission. An applicant requesting a certificate is responsible for the completion and submission of FAA Form 7711-2. The application should be submitted a minimum of 45 days before the banner tow activity will take place. 1) Applications for banner towing operations are processed at the responsible Flight Standards District Office (FSDO) having jurisdiction over the area where the banner tow operator’s principal business office is located. Approval of the application will be completed only after the applicant has met all requirements. The responsible FSDO must notify the applicant of any discrepancies or omissions within 15 days of receipt. Notification of approval or disapproval, or preferably issuance of the CoW, must be completed 15 days prior to the first banner towing operation. Upon approval, the application (FAA Form 7711-2) becomes a part of the CoW. The FSDO manager or his or her designated representative, which may be either the assistant manager or another supervisor from within that FSDO, signs CoW J550 in WebOPSS. An inspector may sign on behalf of the manager or supervisor so long as the manager or supervisor has final review. 3) If the applicant has a pending or denied application, the inspector should review and make queries regarding the status of that application or the reason for disapproval. The aviation safety inspector (ASI) should make sure there are no duplicate WebOPSS entries and address any outstanding issues. I. Expiration. CoW J550 expires 24 calendar-months from the date of issuance. A certificate may be reissued after a properly completed FAA Form 7711-2 is submitted to and processed by the responsible FSDO. The operator may renew the CoW by submitting an application to the responsible FSDO for renewal at least 45 days prior to the expiration date. J. Enhanced Vital Information Database (eVID) Office File. Create an eVID noncertificated activity file for the operator. Use activity code BT (Banner Tow). This record must be validated yearly and inactivated after the waiver is cancelled or expires. 1) The inspector must determine whether a banner will create a hazard to persons or property if deliberately or inadvertently dropped. A banner towing operation is conducted “around” an open-air assembly rather than “over” an open-air assembly of persons, to reduce the likelihood of dropping a mast assembly (lead pole) or large banner on an open-air assembly of persons. Most banners are constructed so that they perform as a self-contained parachute with the weighted mast assembly descending at an arrested rate when released. • Has a reliable record of successful completion of a banner towing training. 3) At least one pickup and drop of the maximum number of letters or panels or the largest advertisement to be used by the certificate holder must be demonstrated. This demonstration should be observed from the ground to allow the inspector to evaluate the competence of any essential ground personnel as well as the flight operation. 4) When banner towing operations are conducted for compensation or hire, the pilot must have at least a limited Commercial Pilot Certificate (without an instrument rating) and at least a valid second-class medical certificate. An instrument rating is not a requirement for this operation. 5) Satisfactory coordination of ground crew signals can be critical to banner towing operations. Ground crews lay out the banner, elevate the top of the mast assembly for pickup, retrieve the banner after the drop, and, if necessary, signal the correct approach to the pilot. B. Banner Pickup and Drop. Some airports are not large enough for the pilot to maneuver into a proper wind orientation and do not have a suitable staging area for banner towing operations. Therefore, the inspector must ensure that pickups and drops can be made without compromising the safety of persons, equipment, or property on the surface. The pickup and drop must be in an area free from use by the public and employees other than ground crews, and free of any obstructions or property that would cause a safety issue. Preferably, the pickup and drop area should be located away from active runways and taxiways, unless the banner tow operator has an agreement with the airport operator to use these areas. If a runway or taxiway is used, the banner tow operator and the airport operator should cooperate in the preparation of an appropriate NOTAM. The airport should have a clear approach path to the drop area that allows a safe banner drop operation. 1) During pickups, a moderately steep maximum performance climb should be used to “peel” the banner off the ground and avoid dragging it. In no case should the mast assembly contact the ground after pickup. a) For aerial pickup, the banner should be laid out flat on the ground within 30 degrees to the wind. Check the attach points at the top of the poles to ensure that the rope will slip off the top smoothly. The slip loop should travel freely so the grapple hook can engage and tighten the slip hook. b) For ground pickup, the banner should be laid out within 30 degrees of the aircraft heading; this prevents banner entanglement. 2) The drop approach path should be into the wind and conducted at a sufficiently high altitude to allow the pilot to descend at a moderately steep angle when approaching the drop zone. If the release mechanism fails, the pilot must be in a position to make an aborted drop (“go around”) and climb so that the mast assembly does not hit the ground. The pilot must maintain sufficient speed and altitude to maneuver in the case of an aborted drop and recover without the banner contacting the ground. C. Helicopter Banner Towing. The inspector must ensure that means are provided to prevent the banner from becoming entangled in the helicopter’s tail rotor during all phases of flight, including autorotations. 1) The only way to prevent the banner from tangling in the tail rotor during autorotation may be to jettison the banner. d) Comply with part 133 during the banner towing operation. 3) The operator should take into account the lowest point on the trailing banner when determining a helicopter’s correct flight altitude. For safety purposes, the altitude should be sufficient for the aircraft and trailing banner to comply with § 91.119(b) and (c). Some banners may extend more than 250 feet behind the aircraft. D. Conducting the Site Inspection. Use the Part 91 Banner Tow Waiver Issuance and Operations Surveillance Job Aid (see Figure 3-10) to conduct the site inspection. An Airworthiness inspector must determine the airworthiness of the aircraft, hitch, and hitch installation. 2) Installed Non-Original Factory Tow Hitch. If the tow hitch is not a part of an original factory installation, inspect aircraft records before initial operation to ensure that FAA Form 337, Major Repair and Alteration (Airframe, Powerplant, Propeller, or Appliance), which describes the installation of the tow hitch, is part of the aircraft maintenance records. There may also be a Supplemental Type Certificate (STC) for this installation. 3) Verification of Pilot and Medical Certificates. Verify that all pilots of banner towing operations for compensation or hire have at least a Commercial Pilot Certificate and at least a valid second-class medical certificate. An instrument rating is not a requirement for this operation. 4) Verification of Registration and Airworthiness Certificates. Verify that the registration certificate, the airworthiness certificate, and any placards are on board the aircraft. If the aircraft is a restricted category civil aircraft, the operating limitations must also be on board the aircraft. • The attaching rope has no indication of knots and is the appropriate length for the operation. • The hitch loop fits tightly. 5) Demonstration of Pilot Proficiency. The waiver holder must conduct at least one pickup and drop to demonstrate pilot proficiency to an Operations ASI. The pickup and drop must contain the maximum number of letters (panels) or the largest advertisement the operator plans to use. 6) Adherence of Pickup and Drop. Ensure that each pickup and drop by a pilot meets the requirements in subparagraph 3-64B. Refer to FAA/FS-I-8700-1 for additional information. 7) Prearranged Communication Signal. If a ground crew is used, ensure that a prearranged communication signal has been established, so the ground crew can notify the pilot or banner tow operator of problems or malfunctions with the equipment or banner. E. Guidelines for Issuance of the Certificate. 1) Requests for waivers to the minimum safe altitudes of § 91.119 must be denied without exception. 2) The operator is responsible for knowing state and local ordinances that may prohibit or restrict banner towing operations. FSDO knowledge of state and local ordinances is helpful in assisting applicants. a) If an issue or question arises concerning state or local government regulations that regulate FAA-authorized banner towing in a way that affects airspace management or aircraft flight and operations, or interfere with other Federal policies or regulations, the inspector must contact the Office of the Chief Counsel (AGC) for resolution. b) CoW J550 states that the CoW does not waive any state law or local regulations. This is a disclaimer of responsibility by the FAA for the enforcement of state or local ordinances. Direct any questions received concerning this note to AGC. c) The FAA does not regulate the content or messages displayed on banners towed by aircraft. Contact AGC for further information. d) A site inspection should be conducted before the initial issuance of a certificate to engage in banner tow. 3) The authorized area can be limited to the responsible FSDO’s geographic area; or, for a national operation, specify “The 48 contiguous United States and District of Columbia.” Specific geographic locations may be entered in the J550 template, subparagraph 6, using free text. 4) If the applicant requests operations outside of the geographic area of the FSDO that issued the CoW, the operator will provide written notification, by letter or email, to the non-issuing FSDO not less than 7 days prior to commencing operations in that FSDO’s geographic area. Notification will include applicable date﻿(s) of operation, location(s) of operation, and operator contact information. The non-issuing FSDO should review the CoW and verify that no additional provisions need to be added for operations in their specific geographic area. If additional provisions must be added to the CoW, the non-issuing FSDO must contact the issuing FSDO to coordinate added provisions. 1) The special purpose modification does not meet the type design. 2) The special purpose modification is not approved for standard category use. H. Weather Limitations. Normally, banner towing operations are limited to day, visual flight rules (VFR)-only operations. However, the inspector may wish to consider additional weather limitations (e.g., crosswinds or high winds) based on the area of operation and equipment/aircraft used. J. Change of Pilots and Aircraft. The certificate holder must maintain a list of all pilots and aircraft to be used in the operation. Whenever there is a change of pilots or aircraft, the responsible FSDO must be notified at least 7 days (or 5 business-days) in advance of the first date the new pilot or aircraft is scheduled to operate. 1) The FSDO notification must include an updated FAA Form 7711-2. For ease of update, pilots and aircraft may be listed on a separate page that is attached to the FAA Form 7711-2. If a separate page is used, it must be dated and signed by the responsible person. 2) Each first-time banner tow pilot presented by the operator should be observed in preflight, banner pickup, banner tow, and banner drop by the FSDO prior to assignment to a commercial banner tow flight. In the case of newly acquired aircraft, especially a restricted category civil aircraft, an Airworthiness inspector may choose to inspect the aircraft. 3) The FSDO must approve the updated FAA Form 7711-2 before the operation involving the new pilot or aircraft takes place. The approved FAA Form 7711-2 must be attached to the CoW J550 certificate. An update to the FAA Form 7711-2 pilot or aircraft list does not require an update to CoW J550 and should not reset the 24 calendar-month waiver approval. K. Operator Responsibility. Operators who hold a waiver have the responsibility of training each new pilot in banner towing operations and in the special provisions of the waiver. The approved FAA Form 7711-2, which lists the current approved pilots and aircraft, along with CoW J550 and its special provisions, must be carried on board during banner towing operations. L. Adherence. The FAA inspector determines compliance with the waiver and the attached special provisions by an onsite inspection. Failure to comply with the waiver and the attached special provisions may constitute justification for rescinding the waiver. 3-65 PREREQUISITES AND COORDINATION REQUIREMENTS. A. Prerequisites. This task requires knowledge of FAA policies, the regulatory requirements of 14 CFR parts 61 and 91, and qualification as an ASI (Operations). B. Coordination. This task requires coordination with the FSDO airworthiness unit. 3-66 REFERENCES, FORMS, AND JOB AIDS. • Title 14 CFR Parts 1, 61, and 91. • FAA/FS-I-8700-1, Information for Banner Towing Operations. • Volume 3, Chapter 3, Section 3, Issue a Certificate of Waiver for Restricted Category Civil Aircraft. • FAA Form 7711-2, Application for Certificate of Waiver or Authorization (see Figure 3-6). • FAA Form 8000-36, Program Tracking and Reporting System Data Sheet. • WebOPSS CoW J550, Banner Towing Operations. • Sample letters and figures. • Part 91 Banner Tow Waiver Issuance and Operations Surveillance Job Aid. NOTE: Figure 3-12, Banner Towing Operations Job Aid, is a banner towing operations job aid that can be used as a training guide for information. This is not to be considered the only format or the only topics to be covered. The ASI will be the final authority of what will be required for training for his or her jurisdictional area and operators. 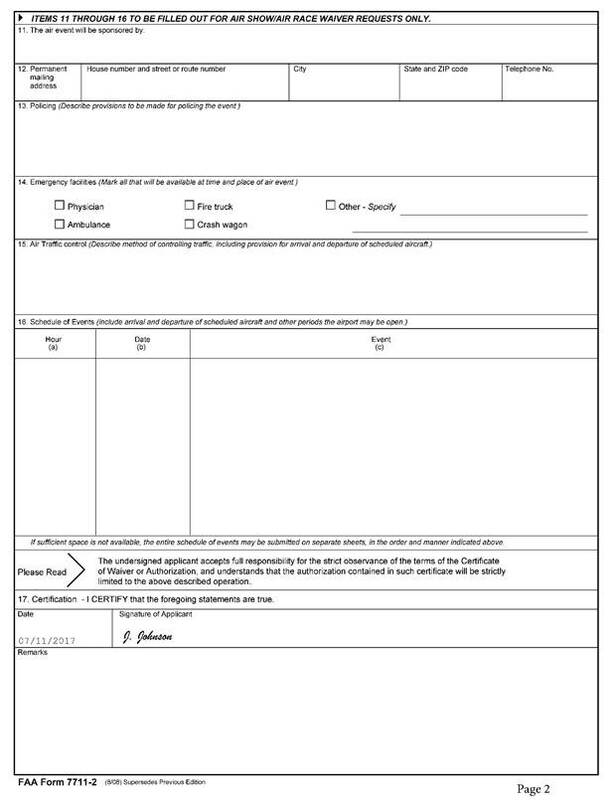 1) Discuss FAA Form 7711-2 (see Figure 3-6) and the instructions for the completion of the form (see Figure 3-7, Instructions for Completion of FAA Form 7711-2) with the applicant. 2) Advise the applicant to complete blocks 1 through 10 and block 17, and that the application must be submitted to the responsible FSDO at least 45 days before the planned banner towing operation. B. Open the PTRS Record. Make the appropriate PTRS entries. C. Review FAA Form 7711-2. Review FAA Form 7711-2 for all pertinent information for the proposed banner towing operation. Accept strikeovers that are minor in nature and initialed by the applicant. Blocks 11 through 16 apply to air show and air race waiver requests only. 1) Blocks 1 and 2Name of Organization/Name of Responsible Person. If the applicant is a representative of an organization, the organization’s name should appear in block 1. The name of the individual and his or her position or authority to represent the organization (e.g., the “responsible person”) should appear in block 2. If the applicant is not representing others, the term “N/A” should be entered in block 1 and the applicant’s name should be entered in block 2. 2) Block 3Permanent Mailing Address. Ensure that the applicant indicates the permanent mailing address of the organization or individual named in block 1 or 2 and that they are located in the FSDO’s jurisdiction. 3) Blocks 4 and 5Pending/Denied Waiver. The applicant should state whether the applicant or any of its principal officers/owners has an application for waiver pending at any other office of the FAA, whether the applicant or any of its principal officers/owners has ever had its application for waiver denied, or whether the FAA has ever withdrawn a waiver from the applicant or any of its principal officers/owners. 4) Block 614 CFR Sections and Number To Be Waived. Ensure the applicant has listed § 91.311; and if the aircraft is certificated in the restricted category and intends to operate in areas prohibited by § 91.313(e), then § 91.313(e) should also be listed. 6) Block 8Area of Operation. a) Ensure that the applicant has listed specific locations and altitudes of the proposed operation. b) The applicant should list the geographic area(s) where the banner towing operation will be conducted. If the operator has a national operation, it is acceptable to issue an authorization for the “The 48 contiguous United States and the District of Columbia.” If the operator wishes to include those states or territories outside the contiguous United States, such as Alaska or Puerto Rico, ensure they are added to the waiver application as applicable. a) Ensure that the applicant has included a beginning date, an ending date, and specific hours (for a one-time event) for the planned operation. b) Ensure that the requested dates do not exceed 24 calendar-months. 9) Block 17Certification. Ensure that the applicant has signed and dated each page of the application. D. Accident/Violation Data Retrieval. Consult the Enforcement Information System (EIS) and Accident/Incident Data System (AIDS) database for the accident/violation history of the applicant or pilots. 4) Return the application and the letter of disapproval to the applicant. F. For Initial Issuance. If FAA Form 7711-2 has been completed and the application is for initial issuance of a certificate to engage in banner tow, conduct a site inspection. G. Not for Initial Issuance. If FAA Form 7711-2 has been completed and the application is not for initial issuance, prepare CoW J550 in WebOPSS. NOTE: An update to the FAA Form 7711-2 pilot or aircraft list does not require an update to CoW J550 and should not reset the 24 calendar-month waiver approval. 1) Schedule Site Inspection. Contact the applicant by telephone or letter to schedule a date and time to conduct the site inspection. 2) Complete Site Inspection. Using the Part 91 Banner Tow Waiver Issuance and Operations Surveillance Job Aid (see Figure 3-10), coordinate with the airworthiness unit to inspect the aircraft, aircraft records, hitch, and hitch installation; and confirm the appropriate airworthiness certificate for the proposed operation or aircraft modification(s) (if any). 5) Make appropriate PTRS entries. 1) Approved Section. Mark the appropriate section of FAA Form 7711-2 “Approved” and date and sign it. 2) WebOPSS. If the part 91 operator conducting banner towing operations is not already established in WebOPSS, it must first be added to the responsible FSDO through the WebOPSS “CHDO” menu under “Operators”  “Maintain,” by selecting “Add.” When issuing a part 91 J550 from WebOPSS, at a minimum, letters of authorization (LOA) A001 and A004 must be included in the operator’s package. 3) Special Provisions and FSDO Coordination. CoW J550 contains standard special provisions. Figure 3-8 shows additional special provisions that are based on any special equipment involved, particular geographic or meteorological considerations, maximum number of letters or panels or the largest advertisement to be used, wind limitations, and airport limitations. If needed, these additional special provisions may be added to J550 under subparagraph 10 by the responsible FSDO and may include coordination with other FSDO(s). 4) Signature of CoW J550. Prepare the appropriate sections of CoW J550. The responsible FSDO manager or his or her designated representative, which may be either the assistant manager or another supervisor from within that responsible FSDO, signs the CoW J550. An inspector may sign on behalf of the manager or supervisor so long as the manager or supervisor has final review. 5) Review. Attach to CoW J550 the LOAs A001 and A004 and a copy of the approved FAA Form 7711-2 (and its supporting documents) for management review. 2) Send the signed FAA Form 7711-2, LOAs A001 and A004, and CoW J550 (which includes the special provisions), with a “file copy,” to the operator. The operator must sign and return copies of A001, A004, and J550 to the FSDO, unless signing the documents electronically in WebOPSS. L. Close the PTRS Record. Make appropriate PTRS entries. M. eVID. Complete the part 91 operator eVID record. • An indication on the part 91 job aid of a satisfactory or an unsatisfactory inspection. • Approval of an application and issuance of a CoW that contains the special provisions within WebOPSS. • Disapproval of an application and issuance of a letter of disapproval. • Reissuance of the CoW using WebOPSS. • Update of the part 91 operator eVID entry. • Surveillance of banner towing operations being conducted. Blocks from FAA Form 7711-2 are explained below for the purpose of uniformity of use. However, not all blocks on the form may be applicable to the application request for the banner towing operation. Blocks 11 through 16 apply to air show and air race waiver requests only. A. Blocks 1 and 2Name of Organization/Name of Responsible Person. If you are a representative of an organization, then the organization’s name should appear in block 1. Your name and title or position, as the organization’s representative, for application purposes should appear in block 2. If you are not representing an organization, enter the term “N/A” in block 1 and your name in block 2. B. Block 3Permanent Mailing Address. Enter the permanent mailing address of the organization or responsible person in block 3. C. Block 4Pending Waiver Application. State whether you or any of the principal officers or owners currently have an application for waiver pending at any other FAA office. D. Block 5Denial or Withdrawal of Previous Application. You should also state whether you have had an application for a waiver denied or if the FAA has ever withdrawn a prior waiver issued to them or to any of the principal officers or owners. E. Block 614 CFR Section and Number To Be Waived. All applicable 14 CFR sections and numbers that are to be waived for the operation to be conducted must be listed in this block. If you are unsure which 14 CFR sections will need to be waived, contact the responsible Flight Standards District Office (FSDO) for guidance. Verify that § 91.311 is listed, and if the banner tow aircraft is of the restricted category and plans to operate in areas prohibited by § 91.313(e), also verify that § 91.313(e) is listed. G. Block 8Area of Operation. List the geographic area(s) where the banner towing operation will be conducted. If you have a national operation, it is acceptable to request an authorization for “The 48 contiguous United States and the District of Columbia.” If you wish to include those states or territories outside the contiguous United States, such as Alaska or Puerto Rico, simply add the additional states or territories in block 8, as applicable. H. Block 9Time Period. Ensure you have included a beginning date, an ending date, and specific hours (for a one-time event) for the planned operation. Ensure that the requested dates do not exceed 24 calendar‑months. The application should be submitted to the responsible FSDO at least 45 days before the beginning date of the banner towing operation. If the application is for a one-time banner towing operation, it is advisable to request an alternate date for the operation. Alternate dates should be listed in this block. If there are any questions, please contact the FSDO. J. Block 17Certification. As the applicant or an organization’s representative, you must sign in this block and on each page of the application. 1) Appropriate airport officials will be notified in advance when banner towing operations will be in close proximity to an uncontrolled airport. 2) Tow attachment and release mechanisms on the aircraft must be approved by the FAA. 3) A thorough inspection of the aircraft and special equipment must be made prior to each day’s operation. 4) Only essential crewmembers will be carried during banner tow operations. 5) When banner towing operations are conducted around congested areas, due care will be exercised so that in the event of an emergency release of the banner or tow rope it will not cause undue hazard to persons or property on the surface. 6) The altitudes for operations must be in accordance with 14 CFR part 91, § 91.119. The waiver holder is fully responsible for safeguarding persons and property on the surface during flight. 7) Except when necessary for takeoff and landing, all flights will be conducted at or above 500 feet above ground level. 8) No cargo may be carried, nor may any dispensing materials be carried in the hopper, or carried in bulk packages or metal containers on board the helicopter when operating in accordance with this waiver. This letter is to inform you that the application you submitted on [date] has been disapproved for the reasons listed in the Remarks section of FAA Form 7711-2. Please make the corrections noted and return to this office within 15 days of receipt of this letter. If you have any questions or comments, please feel free to contact this office at [telephone number]. a. Certificate appropriate to operation. b. Medical certificate appropriate to the certificate. c. Enforcement Information System (EIS) and Accident/Incident Data System (AIDS) checked. c. Hitch and release mechanism. e. Sign mounting and light operation. This letter is to inform you that the following discrepancies were found during the site inspection conducted at your facility on [date]. Please correct the discrepancies noted above within 30 days of receipt of this letter. After correction of the discrepancies, please contact this office to schedule a followup inspection. Although banner tow operators are responsible for complying with appropriate regulations and airspace-related restrictions, inspectors need to be aware of the following security information concerning banner towing operations. After the terrorist attacks of September 11, 2001, the FAA issued Notices to Airmen (NOTAM) restricting flight access to certain airspace. In February 2003, the U.S. Congress passed a public law (PL) effectively prohibiting aerial advertising flights at certain events, stadiums, or other venues during specified times. The law prohibited certain operations within specified airspace limits; then it rescinded waivers for the specified events. Finally, the law permitted certain operators who met specified conditions to reapply for a waiver for non-banner-towing operations at the listed events. The law was effective for 1 year. In January 2004, Congress extended those restrictions indefinitely in PL 108-199, Consolidated Appropriations Act, 2004, Division F, Title V, General Provisions, section 521 (dated January 23, 2004). As of this writing, the law is still in effect; however, the flight data center (FDC) NOTAM information has been updated. (C) to allow the operation of an aircraft in restricted airspace to the extent necessary to arrive at or depart from an airport using standard air traffic control procedures. (b) Limitations on Use of Funds.None of the funds appropriated or otherwise made available by title I of this Act may be obligated or expended to terminate or limit the restrictions imposed under the Federal Aviation Administration Notices to Airmen referred to in subsection (a), or to grant waivers of, or exemptions from, such restrictions except as provided under subsection (a)(2). (c) Broadcast Contracts Not Affected.Nothing in this section shall be construed to affect contractual rights pertaining to any broadcasting agreement. RESERVED. Paragraphs 3-70 through 3-85.